I was lucky enough to be given the opportunity to interview the Founders of the amazing "Tinder for Mummies" app, Mush, who are Sarah and Katie. Here is what they had to say about their well deserved success, Mush and plans for the future. I see that the app is designed for Dads too. How important do you think it is for Dads to build a support network too? Dads are in real need of a support platform, especially given there are so few of them taking up the offer of paternity leave. As a result, raising a small child as a stay at home dad can be a solitary experience. Mush looks and feels like it is made for mums (we designed it with our own experience in mind) but we have a few hundred dads using it successfully. Did you have any idea it would take off like it has? How does that make you feel? We had about a year between the first idea and the app launching and had amassed a pretty good set of statistics to support why Mush was a necessary platform (80% of new mums feel lonely, 54% of mums want more friends nearby). Therefore, we were pretty certain it wouldn’t be a flop. What we underestimated was how much good feedback there would be from the people we were helping, and how this translated to a word of mouth virility that saw us growing by hundreds of mums every day from day one. We were so pleased that no mum had to experience the long days without friends around, like we had. So, we’re really chuffed by the results. I recently saw a post implying that 'Mum friends' aren't 'real friends'. What would you say to that? We saw that too, and thought ‘what an extraordinary thing to say!’ Not every mum you meet and spend time with may be your long-lost soul sister, but we would argue that you could have a pretty good conversation about the stage of your baby if they have kids the same age. If you then also share interests and outlooks, and spend a lot of time together, that deep friendship can forge itself really rapidly. And when you are sharing your most emotionally charged moments of maternity leave, the experience together can count for a lot more than years of Friday night pub sessions… So we say, mum friends are the realest friends of all, and there’s a reason why they have a category all of their own. What is your favourite thing about being a Mum? How long have we got?! For me (Katie), I am a cuddle fiend, so hugs on tap from little people that think the world of me is pretty great. Listening to them grasp language in their clumsy way, and watching them get the hang of new stuff is magical. There’s plenty of not so great stuff too though (tantrums, illness, leaving them, sleep deprivation etc). Any other exciting ideas in the pipeline? We are doing version 2 of the app that will make Mush an even more useful tool for mums so watch this space. Plus, we have a book for the first year of motherhood coming out in July (check it out here). We’re also ambassadors for this year’s PlusnetPioneers campaign, a support programme aimed at helping startup business owners with marketing and funding advice as they build and grow their companies. Other than that, Mush will keep us busy for the foreseeable future! What are your top 3 Mummy must haves? (Katie) My top three must haves now I am a mum. 1) A big bed. We were living in the US when we had Tilly five years ago so we bought a US super king. There’s room for at least a family of seven in there. That you are what you project yourself to be. This is probably the only thing I have ever learnt from a variety of business books, self-help books and autobiographies. It’s only when the person starts believing in themselves that they start to achieve what they set out to. I totally agree with that. Why should anyone else back you if you don’t back yourself? Why do you think some Mums struggle to find their Mum tribe? I’d like to think that since Mush’s launch 18 months ago, people aren’t struggling anymore! But before that, it was a strange new world, navigating your new ‘stay-at-home-mum-life’ and trying to fill it with other people. I remember I used to walk the streets with my pram hoping I might run into a mum coming the other way who might, by some small chance, say hello. My baby was too small to go to classes or the playground, so where was I supposed to meet people to chat with? Let’s not forget humans started in tribes, we evolved to being extended family units, and we have ended up in the nuclear family set up now. We really are meant to be in communities. How does the app ‘match’ Mums together? What criteria does it use? Mush shows all the mums nearby and gives you enough information to let you decide whether to say hi to them or not. Simple as that. Mums put in their location (though this isn’t shown, it only shows distances away), kids’ ages, descriptor tags, an ‘about me’, and a photo. The key is that mums connect with each other locally. Because anyone that has had babies knows that you want to avoid long car journeys if you can help it. What features of the app make it easy to contact other Mums and how are your personal details kept safe? We have in-built messaging - it’s all very standard for a connections app like ours. We take the security of our community very seriously though, so no second name, address or email address is shown on the accounts. Your app has been likened to Tinder, like any dating app / site – do you have any safety tips for meeting up with other Mums? Yes, just like other dating apps (or platforms where you can meet people for the first time) we recommend not sharing personal information to people you haven’t met and meeting in a public place as a first meeting. Especially given kids are often in tow. What makes for creating a great profile? What info should Mums include to really make their profile look fab? The mums that receive (and make) the most connections use emojis in their ‘about me’ and give some context to their life that can be used as a conversation starter, e.g. ‘I am mostly found taking toy dinosaurs out of hiding places my 8-month-old stuffed them in’. A smiley picture is a real winner too. What happens if no-one contacts you or responds to your messages? Any tips? We wholly recommend you contact as many mums as possible. It can be daunting at first but knowing that everyone there is also wanting to make friends makes it easier. Some mums just go offline for periods of time too, so don’t take any non-respondents to heart. It’s great the app is free to download, is it likely to stay that way? Mush will always be free to mums wanting to find a local social network, but apps aren’t cheap to maintain! Eventually we will have to pay for it by introducing some paid for add-ons. 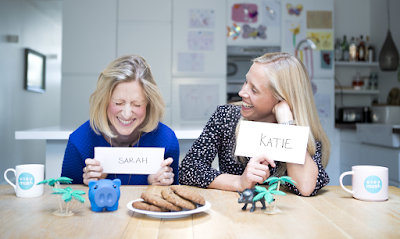 Credit: Sarah and Katie are ambassadors for this years’ PlusnetPioneers campaign, an advice and support programme aimed at helping startup business owners as they build and grow their companies. Thank you to Steph @country_mumma_ and Yvonne @champangeandsnottynoses for the brilliant questions!